Fraternities and sororities are most commonly known as social organizations for higher education or secondary students. College students have always shown a more or less marked tendency to form themselves into societies. William Raimond Baird, Baird's Manual of American College Fraternities (1879), J. B. Lippincott & co., Philadelphia. In the earlier days when the 'college secret societies' were tabooed, the undergraduate members wore no pins or concealed them. Now these are worn constantly over the members' hearts. Clarence Birdseye, Individual Training in Our Colleges (1907), The McMillan Company, New York. p. 309. Alcohol is the No. 1 issue on every college campus I've been on. [But] it isn't just the No. 1 issue in fraternities and sororities. It's the number one issue for all students. Kappa Kappa Psi is an American fraternity for college bandmembers founded by ten men at Oklahoma A&M College in Stillwater, Oklahoma on November 27, 1919. There have been over three hundred chapters installed, with two hundred chapters currently active. Over 66,000 band members have been initiated into Kappa Kappa Psi since its founding. Brothers, I have received medals and honors from every civilized country, but I feel this honor above all, due to the fact that this is given to me by a group of university bandsmen who are furthering the great work to which I have dedicated my life. The ideals as set forth by the Fraternity could not help but make better men and better college band musicians. John Philip Sousa, after his initiation into the Delta chapter in 1922. The very name "fraternity" breathes friendship and communion of souls and I am very proud of my membership in Kappa Kappa Psi. … We, as I have repeated before, must look in the future for talent from the college and high school bands and surely a great many excellent players will no doubt grow out of the instruction received by bright American college men. John Philip Sousa to Grand President Scott P. Squyres, April 19, 1922. National Office Brochure, October 1964. Lambda Chi Alpha, also called "Lambda Chi," is an American collegiate social fraternity founded by Warren A. Cole at Boston University in Boston, Massachusetts on November 2, 1909. There are over two hundred active chapters and colonies at accredited four year colleges and universities throughout the United States. Nearly 300,000 members have been initiated into Lambda Chi Alpha since its founding, making it one of the largest social fraternities. Lambda Chi's National Headquarters is located in Indianapolis, Indiana. About wanting what you can't have. The advent of other Greek letter fraternities met the social needs or supposed needs of underclass men and left Phi Beta Kappa to give sole concern to scholarly affairs. Rev. E. B. Parsons, D. D., Phi Beta Kappa Hand-Book and General Address Catalogue (1900), p. 14. 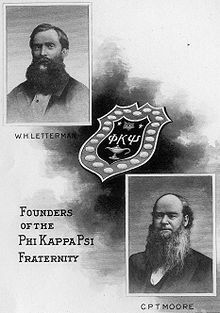 Phi Kappa Psi, also called "Phi Psi," is an American collegiate social fraternity founded at Jefferson College in Canonsburg, Pennsylvania on February 19, 1852. There are over a hundred chapters and colonies at accredited four year colleges and universities throughout the United States. More than 112,796 members have been initiated into Phi Kappa Psi since its founding. I got a great education when I was an undergraduate many years ago, and I think being a member of Phi Kappa Psi Maryland Alpha chapter was a part of that. Its something that's helped form my life. Dealings with my family, my dealings with my friends, my dealings with all my business associates. It was a great experience and I can say nothing but good things about Phi Kappa Psi. I can remember laughter and a lot of it, and the warmth of friendships and a lot of it, and it never went away. and based on ideals, not expediency. Ralph "Dud" Daniel, Executive Director Emeritus of Phi Kappa Psi, from Video for 2008 Phi Kappa Psi National Leadership Award. I certainly didn't have the high school background, in math for example, to be in engineering school. and yet a couple of my fraternity brothers, who were brilliant scholars - electrical engineers, sort of took me under their wing, and without that personal tutoring and help, I wouldn't have gotten out of Valpo. ...One of the things that the Phi Kappa Psi has to offer a young man is not to feel like you're ever going to be a cookie-cut stamped out sort of figure...To have that wonderful kind of anchor of a fraternal group is a geat help to a undergarduate student trying to find his way in this tough and rather impersonal world today. I don't think that college would be the same to me if I didn't have the backing and the help of the people in the Fraternity... I was a Phi Psi when I got here, and I left a Phi Psi. Quotes from Hills and a Star (2001), Phi Sigma Kappa Fraternity; self-published. The spirit of our oldest chapters, combined with the vigor of our youngest who join each year, should inspire all of us to maintain our faith in the principles which unite us, our determination to live by them, and our intention to continue to be the very best fraternity in the greek letter world. Anthony Fusaro, Phi Sigma Kappa; Former Grand Chapter President of Phi Sigma Kappa (p. 9). Fraternities and the fraternity system are a distinctive and praiseworthy feature of American college life. Both as a fraternity man and as an educator, I firmly believe in the value of fraternities when they are properly managed and under good leadership. Dr. Walter C. Langsam; Former President, University of Cincinnati (p. 11). Today, the American people, perhaps as never before, are in need of the unusual, the distinctive, the uncommon man and leader — men and women of character and courage who have undergone the disciplines and the experiences which develop their highest potentials. I sincerely believe that college fraternities are important institutions contributing to the development of such men and women. W.C. Mullendore; Former Chairman, Southern California Edison Company (p. 13). I shall never be able to compensate my fraternity for all that it has done for me, no matter what service I may be allowed to give. In it I have found my most intimate friends. As undergraduate chapter president, I gained broad administrative experience, and from my fraternity I have derived my most cherished ideals of conduct. Dr. Herman B. Wells, Sigma Nu; Former Indiana University President (p. 14). My chapter house was a place where deep friendships were formed. The bond of brotherhood within the chapters was always a sustaining force and an urge to do a better job scholastically and otherwise in campus life. The traits of character which were nurtured there ripened and increased my sense of being useful in later life. D. William Brosnon, Phi Sigma Kappa; Former President, Southern Railway System (p. 16). In my judgment the college fraternity has been of inestimable value in making men across the years... It is natural for men to come together in compatible, mutual friendship, and when they do so under the high ideals of a fraternity, it proves to be most beneficial. Dr. Norman Vincent Peale, Phi Gamma Delta; Author & Minister (p. 17). I took a great deal more from my fraternity than I gave — but what I took was a very great deal — companionship of the highest order, self-confidence born of belonging to a group of which I was proud, enrichment of my personal life, which gave all my college career added dimension, and even an extra bond to several life-long friendships that already existed. Walter Cronkite, Chi Phi; CBS News Analyst (p. 18). I found in my chapter companionship and guidance from older men, discipline and true fellowship. The fraternity is more than just a boarding house. It is a temple of good will, of mutual assistance and enlightenment. The benefits derived are constant companions with alert fellow students in all activities of university life, and it tends to create more mature, responsible and intelligent citizens. Lloyd Wright, Kappa Alpha Order; Past President, American Bar Association (p. 19). She's a dream, what a dream of a girl. In her heart she's as pure as a pearl. Marvin Kahn, Tau Epsilon Phi "Sweetheart" song (c. mid-1930s), reported in The Portals of Tau Epsilon Phi (1937). This page was last edited on 2 November 2014, at 04:41.